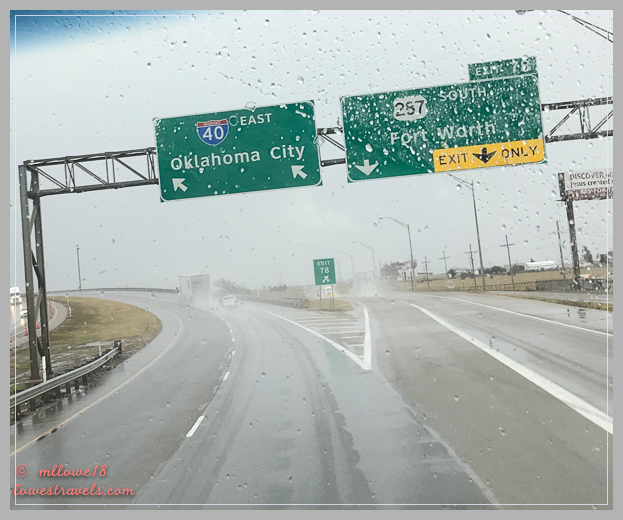 The following morning brought some sunshine and we continued on to Oklahoma City, or OKC as it is affectionately called here. This city hasn’t been on our travel route in past years, but thanks to Steve’s desire to visit the southeast one more time we were able to take a route to include it and several other stops that are firsts for us. 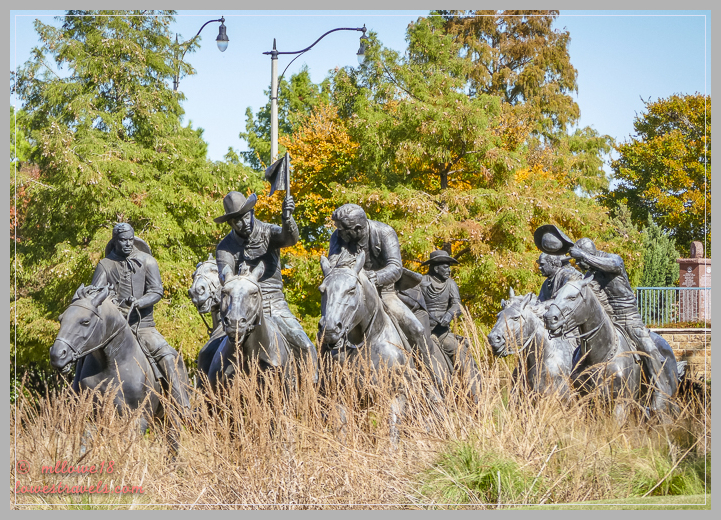 Did you know that Oklahoma City was settled by the historic Land Run of April 22, 1889? 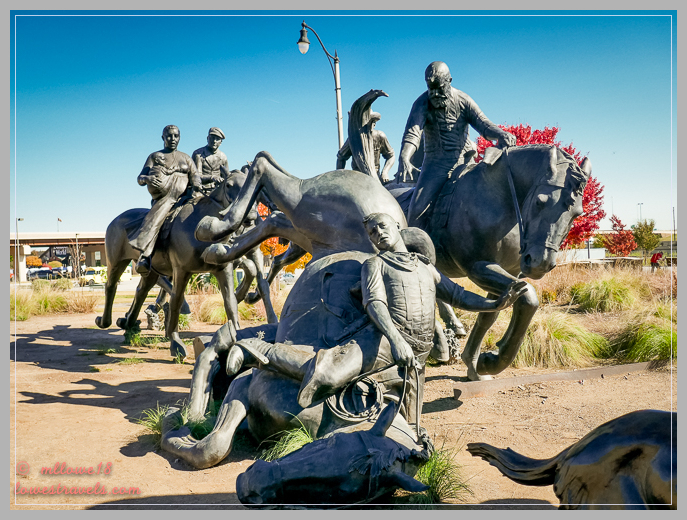 Well, we didn’t until we stumbled upon the Centennial Land Run Monument while walking along the south end of the city’s Bricktown Canal. 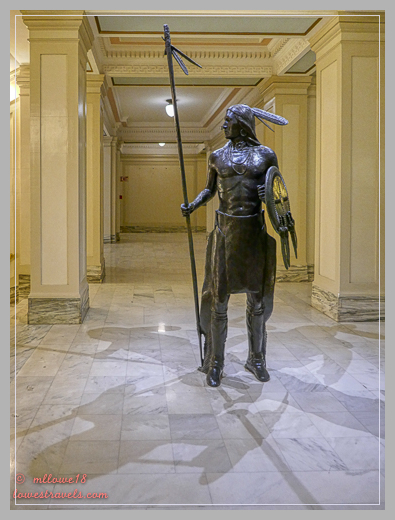 A series of 45 bronze sculptures commemorate the opening of Unassigned Lands in Oklahoma Territory, and feature larger-than-life figures depicting the frenzied energy and emotion from one moment during the race to claim new homesteads. During that chaotic event in 1889, 50,000 anxious settlers massed along the border surged forward at the sound of a cannon shot at noon. 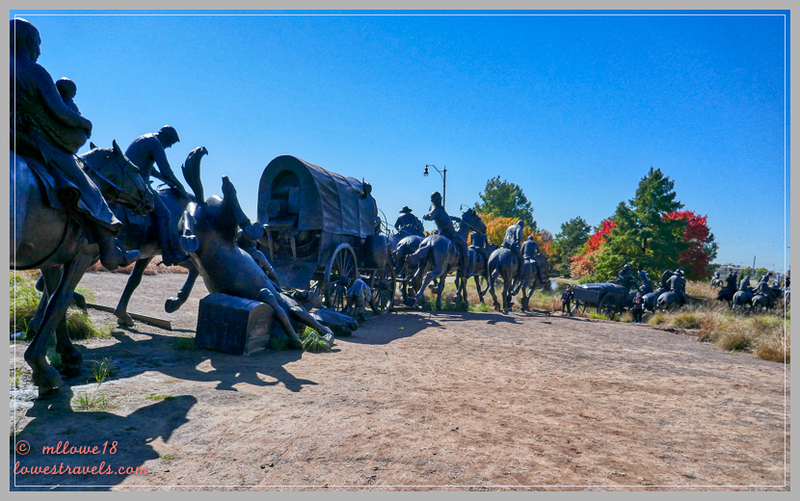 A tumultuous avalanche of wagons and horsemen rushed onto the Unassigned Lands to stake their claim for free land. 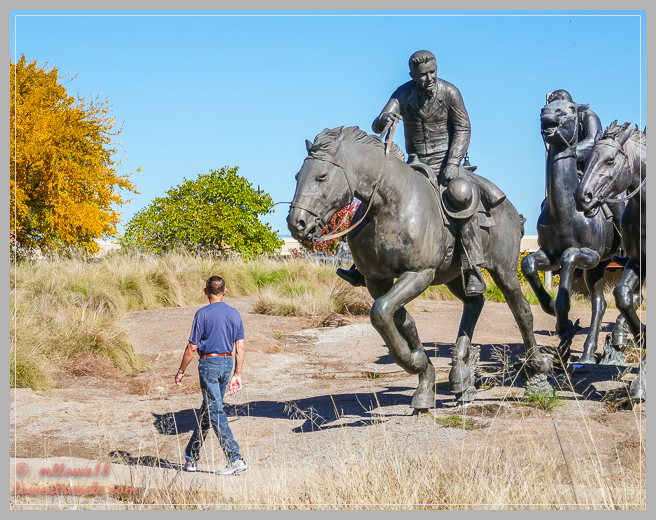 The statues are 1 1/2 times life size, making Steve want to get out of the way! After our interesting history lesson, we continued meandering along the canal and entertainment district, having lunch at The Drake in the Uptown Plaza District. We enjoyed their famous Lemon Cloud Pie free of charge, just because we were out-of-towners. Such warm hospitality! Our friendly server then suggested we take a peek at the art on the area’s plaza walls, a rotating public project that provides mural space for local artists. We walked off the calories from that excellent pie as we viewed some impressive modern street art. 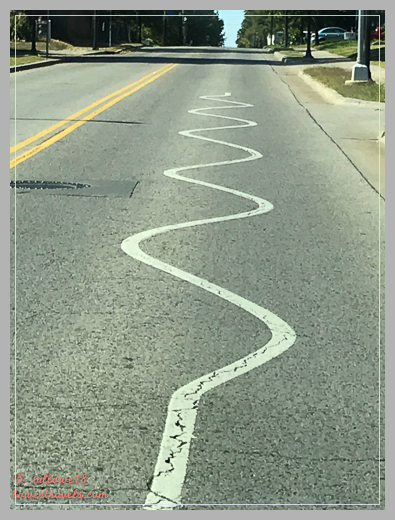 Driving around OKC, we saw these squiggly lines painted on the road. Can you guess what they’re for? We were so curious that we had to ask one of the locals! 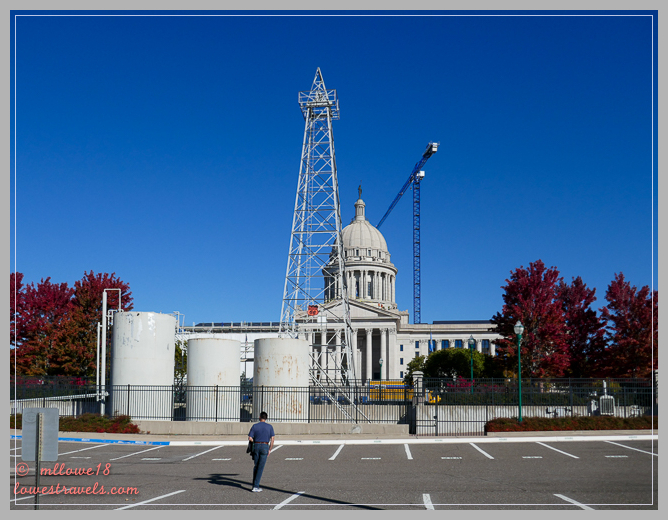 Here’s some more trivia: Did you know that the Oklahoma state capitol is the only capitol building that sits atop a giant oil field? Active oil rigs can be seen all around the capitol grounds. We also learned that the building was dome-less for 85 years after its initial construction. 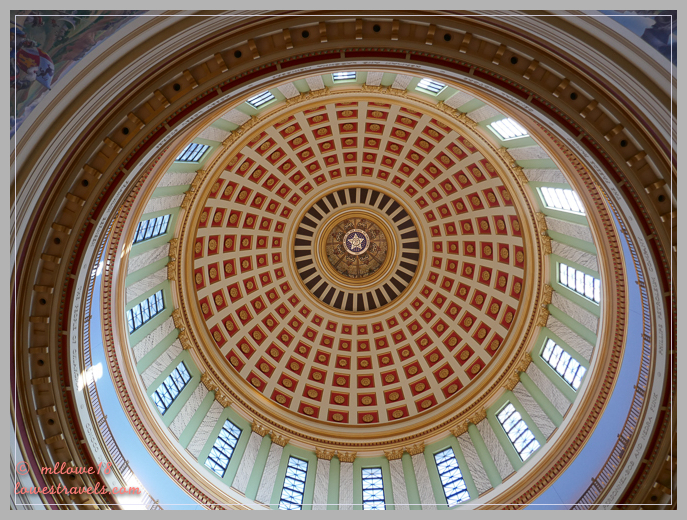 Part of the original blueprint over 100 years ago included a dome, but it was only completed in 2002. Our tour was somewhat limited due to a major restoration that has been underway since 2015. 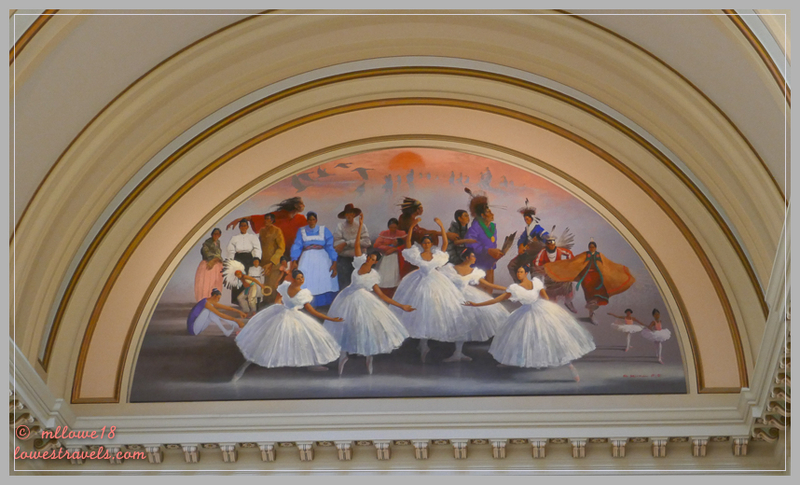 Oklahomans are memorialized through many beautiful murals, paintings, and other artwork (some had been removed for the restoration) at the capitol. 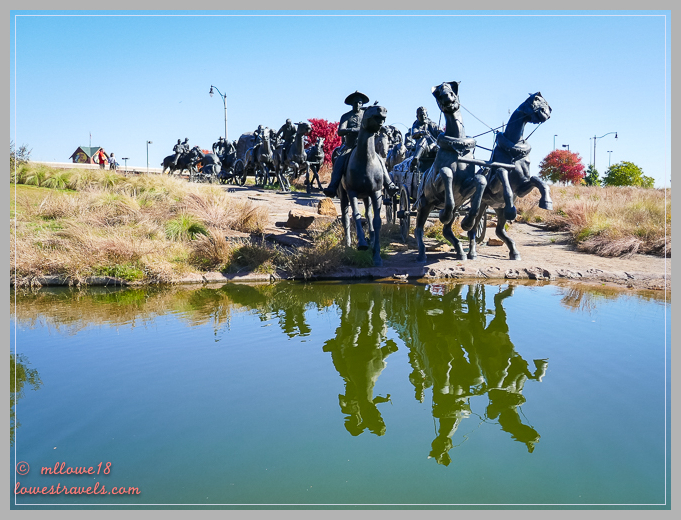 On a rare sunny day we visited the two components of The Oklahoma City National Memorial – the indoor Memorial Museum and the Outdoor Memorial. Viewing the Outdoor Memorial first, we witnessed the symbolic elements that tell the story of that moment on April 19, 1995. 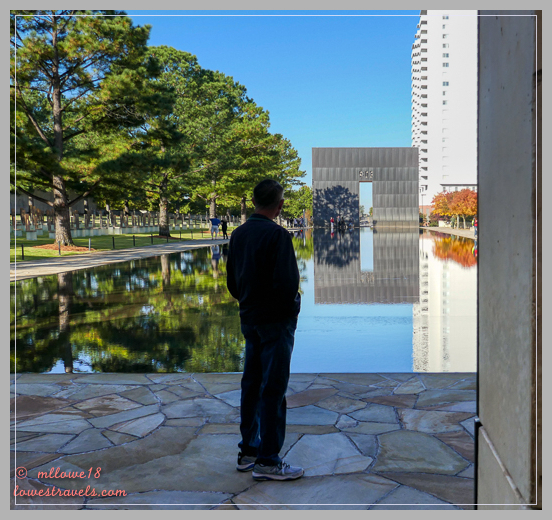 We’ve seen pictures of the memorial taken by our blogger friends, but being there in person was a powerful experience. A “Gate of Time” is erected at each end of what was once the street in front of the Alfred P. Murrah Federal Building. One is engraved “9:01” and the other “9:03”, and they frame the moment the bomb detonated at 9:02am. The 9:01 east gate depicts the innocence before the attack, while the 9:03 west gate marks when the healing began. The Field of Empty Chairs faces the reflecting pool. 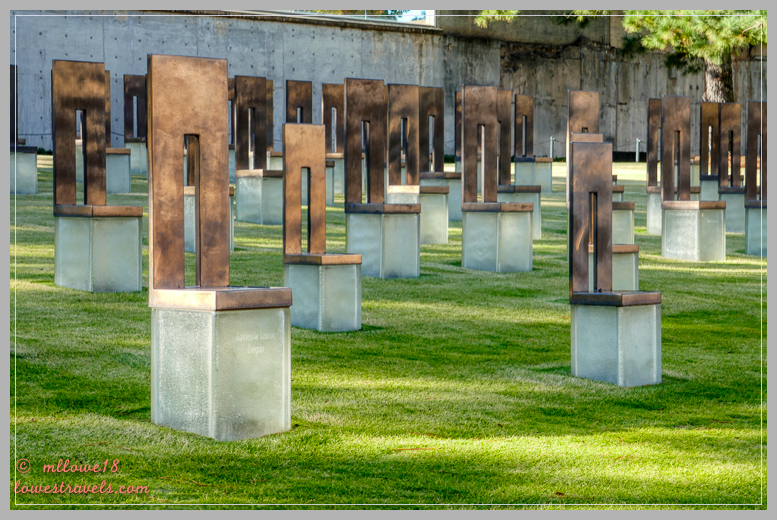 There are 168 bronze chairs, each etched with the name of a person – including 19 children – who died on that day. They were arranged in nine rows that indicate the floor where victims were working or visiting at the time. The memorial also pays tribute to those who survived the blast and the 12,000 rescue workers who came to help from all over the world. It was a sobering experience inside the Memorial Museum. 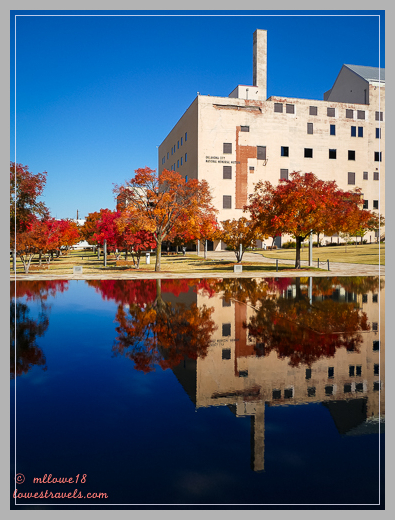 The self-guided tour is organized by chapter, starting with the history of the site, its neighborhood and the Murrah building. Displays show what was happening in the city and around the world in 1995. 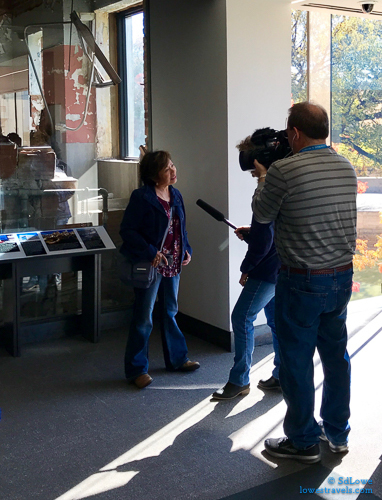 The tour continued with us listening to a recording of a meeting underway when the blast occurred, including the chaos of people trying to escape the building. From there we continued through chapters detailing the rescue efforts and recovery of the city during the days and years after the event. We thought the museum was extremely well done. It’s a factual tribute that doesn’t diminish the tragedy, but offers an inspiring contrast between the brutality of the evil and the tenderness of the response. 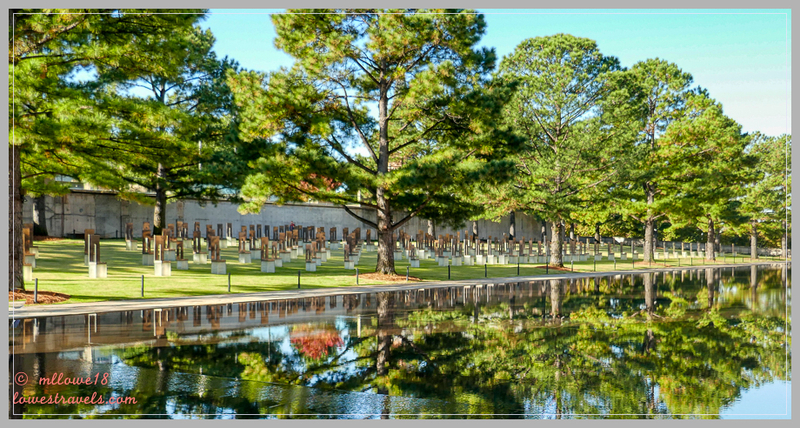 For us, the Outdoor Memorial was a beautiful and symbolic place of quiet reflection that became more meaningful after experiencing the story inside the museum. It was a very emotional yet uplifting day. We have been to the memorial twice and both times were moved to tears. One visit was close to the Christmas holiday and wreaths were placed on all the chairs, a reminder of all those families that had a void in their lives during the holidays, particularly the laughter of children missing. 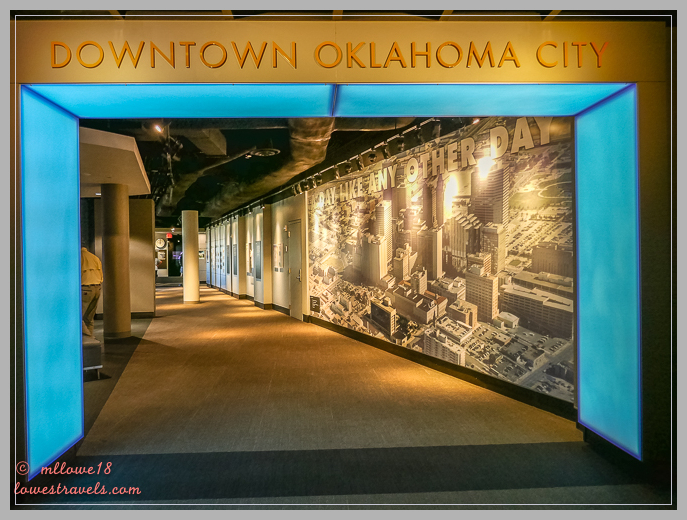 Thanks for sharing so much of the history of OKC. If you do go, I suggest doing the museum first before the memorial. 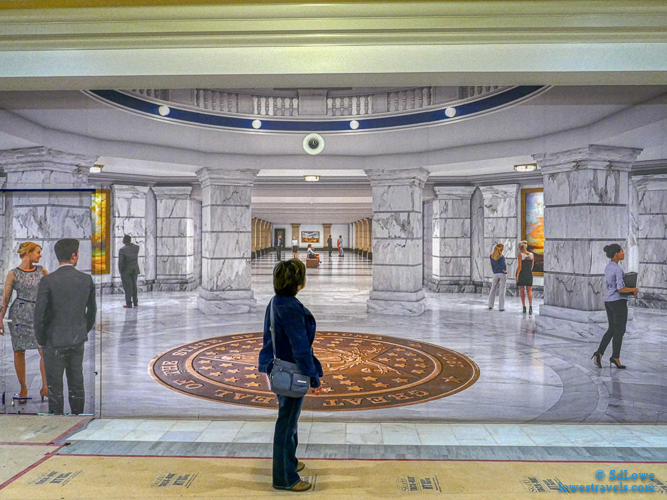 Beautiful photos and detail of the museums. We’ll need to add OKC to our list of places to see. 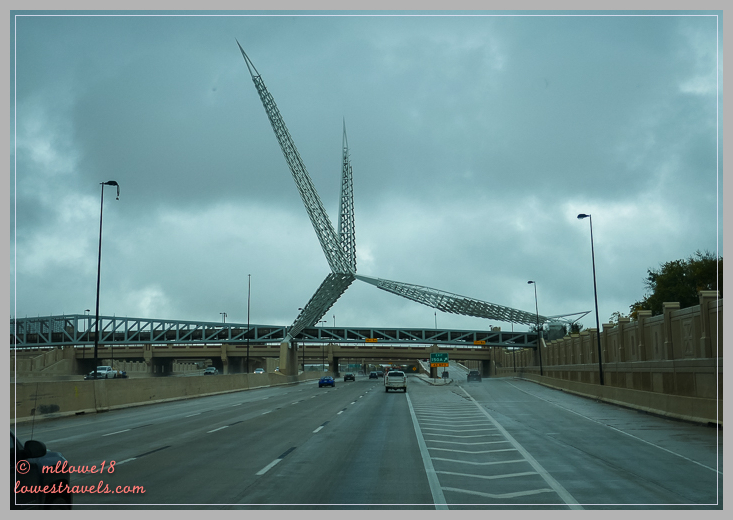 OKC is an off the beaten path city destination simply because it is in the tornado alley. We thought fall was a good time to avoid those nasty weather. So glad you got to visit the Memorial. It is such an impressive and powerful memorial. We also visited the elementary school that was hit by a tornado. The Memorial that is part of school entrance in memory of the students that were killed that day was beautifully done. That area of OK has certainly seen its share of tragedy. Wonderful post MonaLiza! You saw so much more than we did…..but then it rained the entire time we were there so we weren’t crazy about strolling around much. 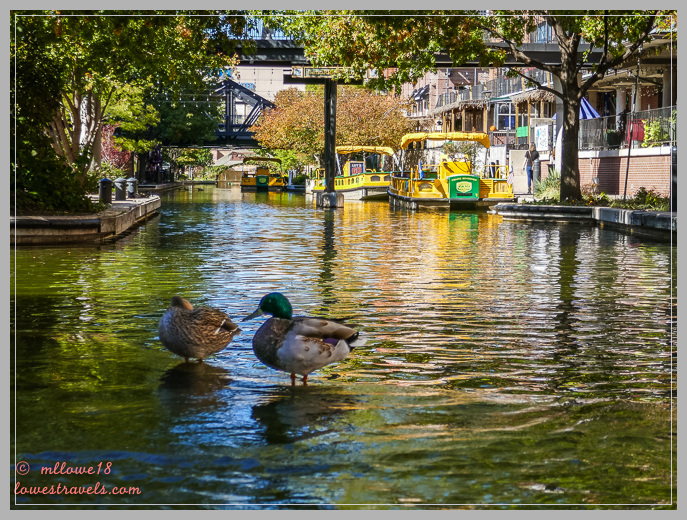 Next time, if there is a next time through OKC, we’ll definitely head for the Bricktown Canal area. The murals are beautiful and interesting and I would have LOVED to see those statues! We lucked out that our short stay there the sun cooperated a bit allowing us to see more and there are more to see. I heard the Botanical Garden is also worth a visit. Perhaps you can do that on your way up or down the country. Another wonderful tour! That sculpture looks amazing and the memorial beautifully done. Yes it was, Ingrid and was glad we could make it this time around. 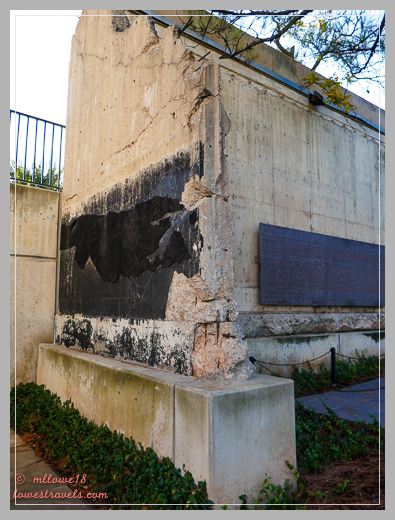 Interesting post from the landgrab to the memorial. History has a way of fading away or changing over time but they did a great job preserving it and you did a great job writing about it. Most of the time we only hear about tragedies in the news or learn their history from books. But visiting and experiencing the city has more impact. I do also think OKC have done well with their preservation of iconic events in their history. 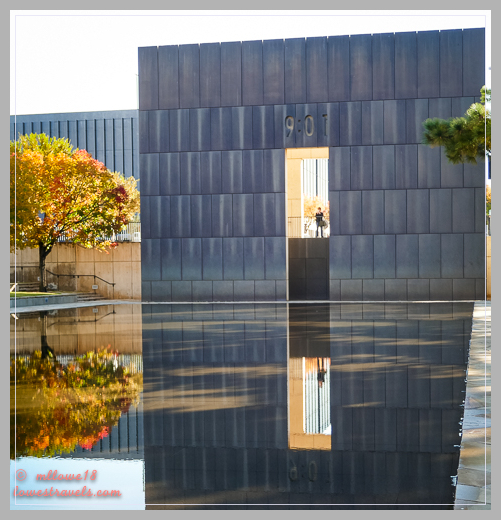 The designers of that memorial really did a wonderful job creating a beautiful site that appropriately pays tribute to all those who were affected and capturing the feeling of that day and its aftermath. I was also so impressed by the sculptures of the land race. What an awesome way to remember that event! Plus, murals! And pie! 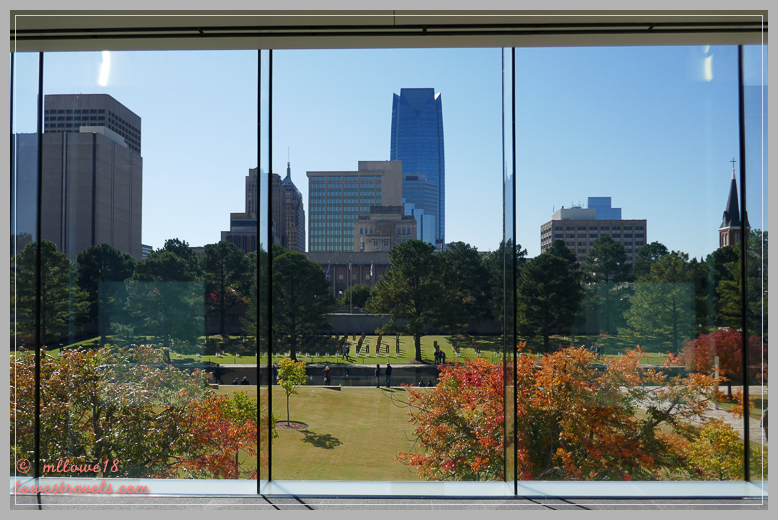 Who knew there was so much to see in OKC?! 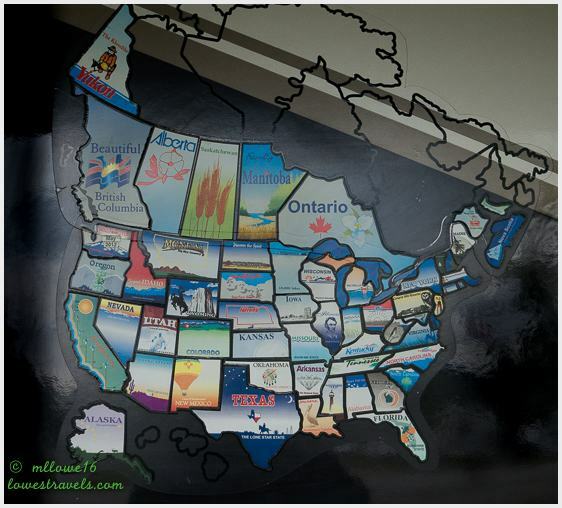 We have many more visits to the southeast ahead of us, and Oklahoma City has been on our list for a long time. 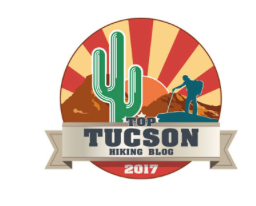 It’s never been very high up on our list, but reading your post and seeing your photos makes me certain that I want to go there. 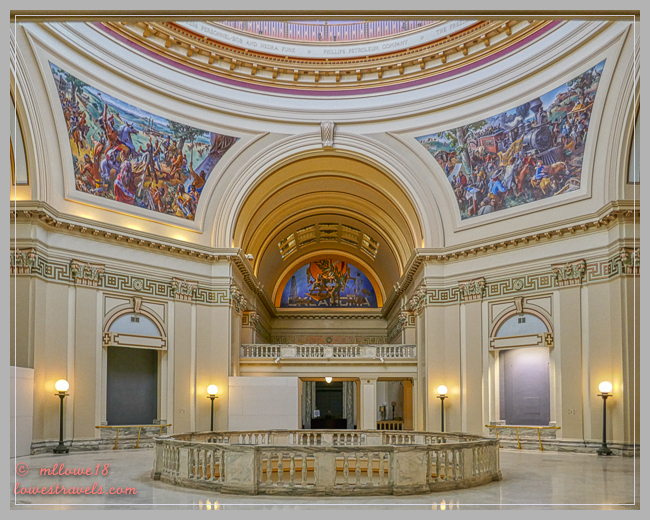 The bronze sculptures of the Land Run are fantastic, the capitol building and artwork are lovely, and the memorial museum looks like an emotionally wrenching, beautiful tribute. Thanks for the tour—we’ll follow your lead! 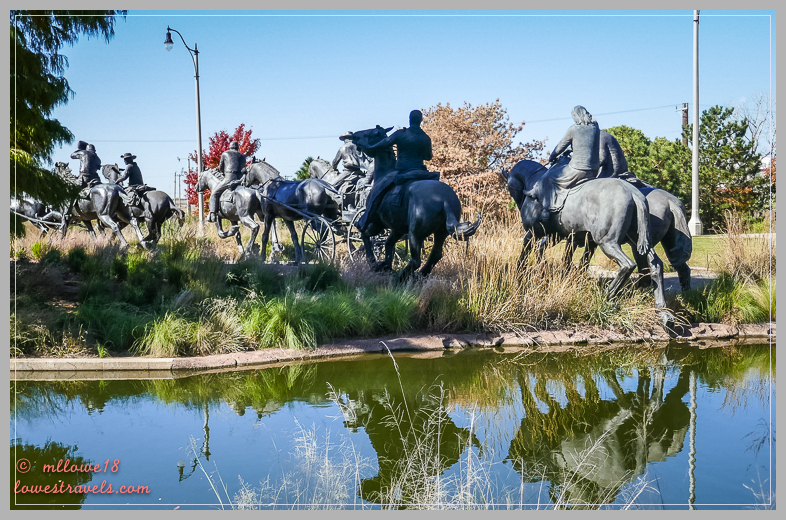 The Centennial Land Run monument was a result of extending our canal walk otherwise we would have missed it. I also wanted to see their Botanical Garden but it was at the bottom of the list and we only had two days here. 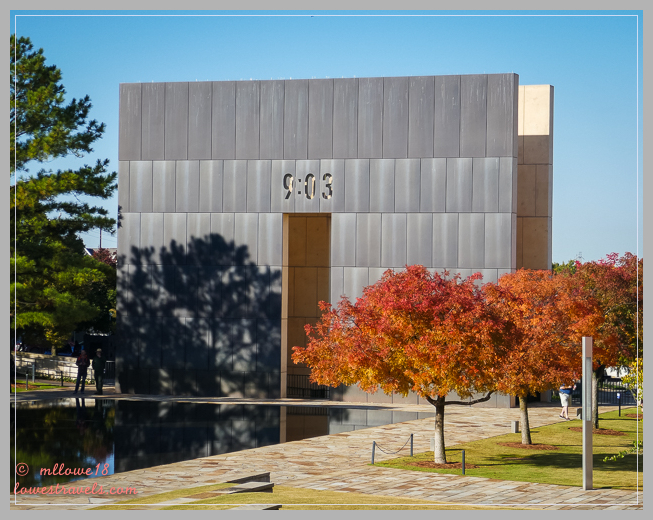 If you do go to the memorial, try to do museum first before the memorial itself. Excellent post and wonderful pictures. It is hard to believe that it has a been that many years. Thanks for the reminder of how precious life is and for those whose lives were tragically cut short that day. Thank you. OKC was originally on our route years ago but it just did not happen. So am glad we took the I40E route and visited the memorial and museum. Thank you, it looked like we are missing a lot. We will take your suggestions should we pass this way again. Currently we are now nearing Florida. Thank you for showing us this beautiful memorial to such a tragic event. 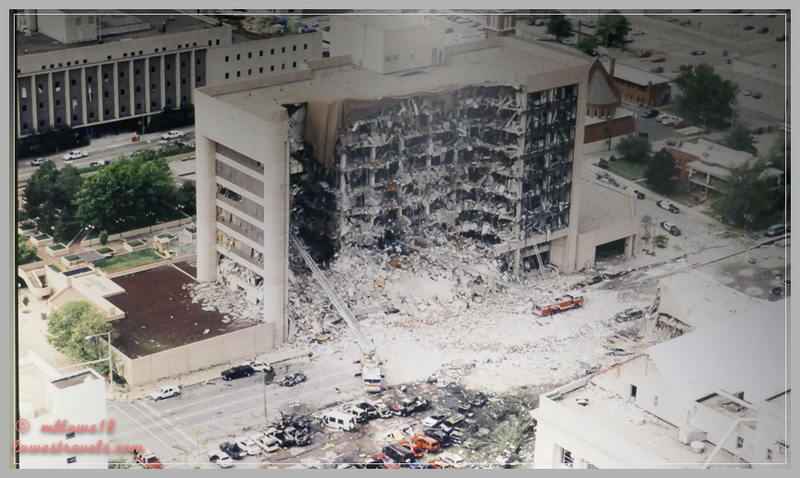 I had a dear friend who worked in a building nearby and shared with me her memories of this horrific day. 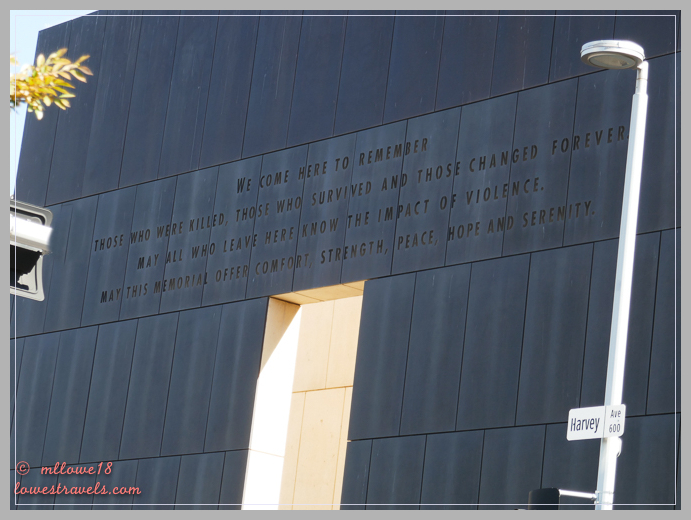 I gathered from the museum that the whole city came together after this tragic event. Now I’m sorry we didn’t go south on the Riverwalk. Something for the next time, which hopefully includes a stop at the museum. We would have missed it too had we wanted a shorter walk. It was a surprise to us when we saw the first horse then a lot more behind it. Don’t say Southeast one more time. That sounds like you’ll never come back. I’ve never been to OKC so thank you for such a nice visit. It seems we have too many beautifully done somber memorials at too many tragic sites. Perhaps next time on your way down to Florida or way back up to your hometown, try to do an off the beaten route and include OKC. I know you will appreciate the tasteful memorial. Thank you for this very well-done post!